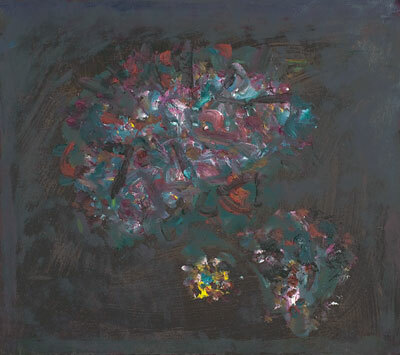 To celebrate Alan Davies 90th birthday, Gimpel Fils is delighted to present Night Gems, the first in a series of exhibitions taking place this year that will chart the career of this extraordinary artist. Comprising works made in the last two years, Night Gems demonstrates Davies unwavering commitment to painting. In his thesis, Towards a philosophy of creativity published in 1997, Davie spoke of the necessity of letting go of material concerns and embracing the intuitive possibilities that can be found in natural states of being unhindered by external anxieties. This letting go of exterior concerns in order to tap into hidden, mystical interior worlds has been Davies life-long project and significantly, he has never been afraid to change his style or painterly technique in order to achive this goal. Davies clean, flat geometric style, familiar since the 1970s is here counterposed by a series of small oil paintings on board, executed in short staccato daubs of colour, perhaps a more volatile form of pointillism. There is a sense of frenetic engery in these paintings, different from the youthful exbuerance found in earlier works: dynamic coils of energy waiting to be unfurled are discernable in the tightly wound spirals of ....For a Birthday, while the dense and crowded areas of patternwork in Wheel Bender bristle with potential energy straining for escape. Shamanism, mysticism, alchemy and magic are concepts closely linked to Davies work. These ideas are manifested in forms reminiscent of a Bhuddist prayer wheel, a crescent moon, the Hindu God Shiva garlanded with a snake, the geometic forms of Hopi basketry. And whilst these forms can all be found in this exhibition, also on display is a series of blue-black paintings suggestive of night meditations, depicting shapes only half comprehended, shrouded as they are in a cloak of darkness. This exhibition is the first of a number of displays in 2010. Other exhibitions will take place at The Stanley & Audrey Burton Gallery, University of Leeds; Callendar House, Falkirk; Kings Place Gallery, London; and Northumbria University Gallery, Newcastle. Alan Davies artwork can be found in numerous international public collections including Tate Collection, London; The Scottish National Gallery of Modern Art, Edinburgh; the Peggy Guggenheim Collection, Venice; Museum of Modern Art, New York; Stedelijk Museum Amsterdam; and Museu de Arte Contemporanea, São Paulo. In November 2004 Gimpel Fils held the inaugural exhibition of its contemporary project space at 30 Davies Street. Downstairs provides a dedicated exhibition space for emerging artists and hosts one-off projects by established practitioners. Downstairs Review: Part I casts an eye over the exhibitions held Downstairs in 2008 and brings together the work of four outstanding artists: Giles Eldridge, Arabella Hope, Susan MacWilliam and Caroline McCarthy. Reviewing the Downstairs exhibition programme enables us to reacquaint ourselves with the work of these artists and create new links and interpretations. Giles Eldridge is engaged with the idea of what constitutes Painting and Drawing. This concern is underpinned by a formal investigation into how the interpretation of art is constructed through an apparently consensual system of definable categories, styles and references. Eldridges contribution to this exhibition takes the form of an installation of numerous drawings, watercolours and paintings, in various sizes and styles. Alongside an immediately apparent interest in the different stylistic forms that Painting and Drawing can take, is an additional curiosity in how that representational form influences and at times, dictates, our readings of the object or motif depicted. Although at first glace Arabella Hopes new portrait paintings appear markedly different from the intimate spaces of domestic bathrooms that featured in her solo show at Gimpel Fils, the two bodies of work are linked by her concern with form and the practice of painting. These paintings of blank-faced figures set against a background of bland 1950s wallpaper demonstrate an evolution in Hopes practice: overlapping planes and patterns are still balance coolness and warmth, but abstract spaces are replaced with evocative and sometimes haunting figures. Emptiness, stillness and uncanny presences are embodied in these portraits and it is a testament to Hopes skill that her paintings are meaningful without depicting narrative incident or activity. Since exhibiting at Gimpel Fils in May 2008, Susan MacWilliam represented Northern Ireland at the Venice Biennale in 2009 and has exhibited widely in the UK and Ireland. Her recent video work has focused on Eileen Garrett, the famous Irish medium who held séances in London and New York. MacWilliam carries out extensive archival research and undertakes interviews with significant figures within the world of parapsychology. In her video works exhibited at Gimpel Fils the use of interview and documentary processes as portraiture is explored; Eileen Garrett is brought to life through the descriptions and gestures of her daughter, Eileen Coly and granddaughter Lisette Coly. The charismatic and multi-facetted Garrett is conjured through image and anecdote, and video vignettes as Eileen Coly recalls events of the 1930s and 40s with humorous aplomb. Nothing is quite as it seems in Caroline McCarthys work. McCarthy utilises everyday objects and materials to create works of art that consider artificial systems of value, taste and economic exchange. For her solo exhibition in 2008 McCarthy presented a new series of work combining the symbolism of a seventeenth century still life painting with the banality of toilet paper in order to explore themes of excess and desire. In this exhibition McCarthy presents a series of new paintings: life-size replicas of used matchboxes. Considering the shift between humble and monumental, throwaway and precious, original and mass production, McCarthy also engages with the idea of, and expectations placed upon, an artist. Collectively, these artists explore the nature of artistic expression, the forms it can take and its role in contemporary society.